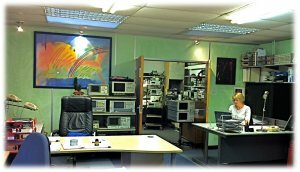 We are a small company established for over 45 years and are well known within the Test and Measurement Industry for both buying and selling test equipment throughout Europe and the U.S. We specialize exclusively in the sale of second hand Test Equipment and high end professional Electronic Test and Measurement equipment. All our instruments are tested to maker’s specifications prior to dispatch by independent calibration laboratories with full National Test Equipment standards and traceability to ensure the highest of quality. Our test equipment instruments are cosmetically reconditioned 'in-house' where necessary to bring units to as near to new appearance as possible. All test equipment carries a 90-day return to base and unconditional 7-day 'full refund' guarantee. In order to give our 'highest possible standards' policy official recognition, we are a quality-assured firm and registered ISO9001 Approved Stockist for Electronic Test and Measurement Equipment. Ralfe Electronics will provide you with the highest quality used test equipment for sale; Rental can also be agreed by special request. We can provide all types of service including test equipment sales, rental, calibration, and also repair. Our on going success is the result of providing the best in class customer service in the test equipment marketplace. During the last 45 years we have built up excellent test equipment knowledge and experience. We have the ability to source used test equipment worldwide. We always provide our customers with high quality pre owned test equipment resulting in huge savings over new. Our online test equipment catalogue is updated daily and can be searched by Manufacturer, Product Type or by using the Part Number. Please goto the ‘Current Stock Page’ to view our full list of equipment. You can also view a full stock list by selecting the Full Stock list option. Please feel free to contact us if you can't find the specific product you need or wish to discuss your requirements. Please call our sales office on +44 (0)1923 721 396.